I work at MNP in Lethbridge. My job title is Senior Manager – Farm Management Consultant. I have been working in agriculture all my life. I was born and raised on a farm, and still own and manage a small farm today! I spent 6 years with Alberta Pool/Agricore as a producer services rep. Now I have been with MNP for 15 years as a farm management consultant. – Contact and meeting with clients on various projects or engagements we have with them. – Seasonality will come into play in terms of how we are helping our clients, for example winter time is heavily weighted to creating plans for the upcoming year, monitoring those plans with the client, benchmarking as well as conducting feasibilities on new opportunities and being a general sounding board for our clients. In my spare time I enjoy running, and spending time with my family. Something people most people don’t know, is that the most famous person I know was my university hockey coach in 1993/1994 at the University of Lethbridge … Mike Babecock! It would have to be riding around in my Grandpa’s old 1940 something three tonne grain truck that was still kicking around the farm. My favourite part of working in agriculture is helping and seeing clients succeed in their plans. Farming is not easy. The most successful farmers understand that they can’t do everything by themselves, and surround themselves with a solid team of advisors and mentors. ‘Failing to plan is planning to fail’?? What I mean is, a planned approach with proper due diligence towards any opportunity will in most cases, help ensure you succeed. 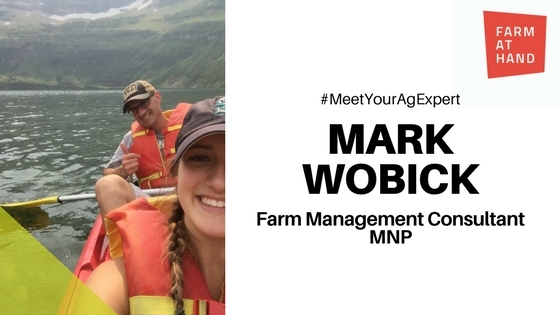 Mark Wobick is a Farm Management Consultant with MNP in Lethbridge, AB. Mark advises on a wide range of business issues relating to the Agricultural Industry. Raised on a Grain Farm in Alberta, Mark continues to manage his own farm business. This hands-on experience coupled with nearly 15 years of industry experience and formal training has given Mark the unique insight that his clients appreciate. Working one-on-one with farmers and agribusinesses, Mark helps his clients optimize their production, control their costs and risk as well as market their products effectively to remain profitable and competitive.